And for MagCast Pro click on Upload Theme button at the top. Click on Install button and for MagCast Pro choose the zip file of MagCast Pro then click on Install Now and activate it. Download the MagCast/MagCast Pro theme. Unzip magcast.zip to your desktop. Upload MagCast/MagCast Pro theme to /wp-content/themes/. Go to Appearance > Themes and activate MagCast/MagCast Pro theme from Dashboard. First create a page with any name or you can set your any existing page to Magazine Template. Follow the instruction below to set the Magazine Template for your page. 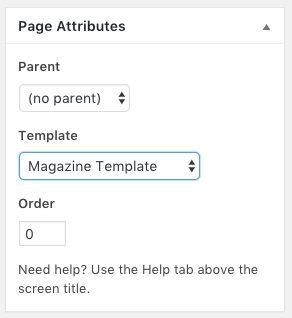 To set the page to Magazine Template go to page editor and you will see the Page Attributes box at the right side. Choose Magazine Template from the dropdown as a Template as shown in below screenshot. After setting up the page to Magazine Template now go to Settings > Reading to set this page as your Home Page (Front Page). Choose A static page (select below) option as your Front Page Displays and choose your page that you have set template to Magazine Template from the dropdown in Front Page as shown in the below screenshot. After setting up the Magazine Template page as you Home Page (Front Page) now go to Appearance > Widgets. Drag and Drop any TH custom widgets i.e. (TH: Advertisement, TH: Horizontal Vertical Post, TH: Two Column Category Post, TH: Two Column Grid and TH: Two Column Large Image to the Magazine Template Primary OR Magazine Template Secondary and set up all the data/content accordingly in all the widgets that you have dropped. Click on Save button. Now you can see your Home Page (Front Page) as Magazine style. From this options you can set Site Layout, Content Layout, Responsive Layout and Full Width Sidebar Display. To set it go to Appearance > Customize > MagCast Theme Options > Layout Options. From this option you can enable/disable responsive layout. From this option you can show Full Width Sidebar content on Homepage/Frontpage only or on all Pages. 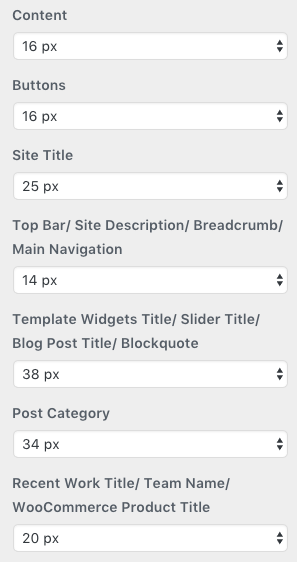 From this options you can set Post/Page Title Background Image and Display Site Title. To set it go to Appearance > Customize > MagCast Theme Options > Header Options. From this options you can set two style for your header. Select on Site Title/ Social Profiles/ Search Form to show your header as below. Select on Site Title/ Add to show your header as below. To set the Advertisement into your header go to Appearance > Widgets and Drag and Drop TH: Advertisement widget to Header Sidebar then set the image and redirect Url in the widget and click on Save button. From this options you can hide info bar as well as date from the info bar and hide search icon from the header as well as navigation. To hide date from the Info bar check on Hide Infobar Date Only option. To hide Info bar check on Hide Infobar option. To hide search icon from the header check on Hide Top Search Form option. To hide search icon from the navigation check on Hide Navigation Search Form option. From this options you can set the Excerpt Length. To set it go to Appearance > Customize > MagCast Pro Theme Options > Excerpt Options you will see the below options. To set the Excerpt Length type the digit value in Excerpt Length field. To set the button text type the text in Post Excerpt Button Text field and click on Save & Publish button. 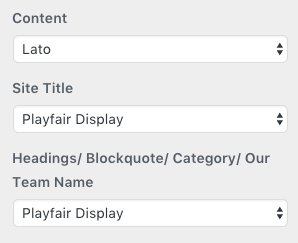 To set it go to Appearance > Customize > MagCast Theme Options > Home Page Blog Category Setting you will see the below options. 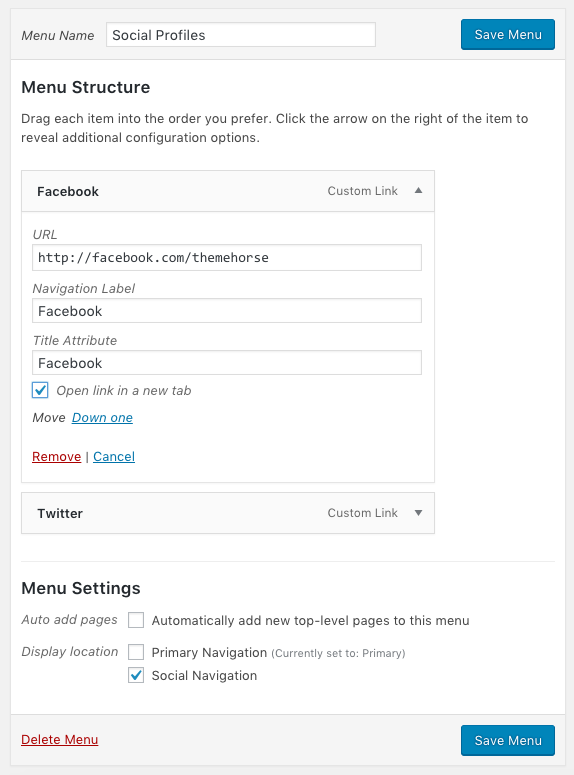 From this options you can disable post meta data from your post. To disable it go to Appearance > Customize > MagCast Pro Theme Options > Post Meta Display Options you will see the below options. 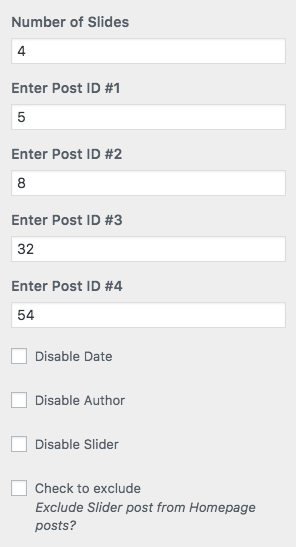 To disable Post Meta data just check on Disable Categories, Author, Date, Comment Link, Tags and Read More box and click on Save & Publish button. To set it go to Appearance > Customize > MagCast Theme Options > Featured Slider Options. Enter the Number of Slides, Post ID accordingly as shown in the below screenshot. To disable the date in the slide check on Disable Date option. 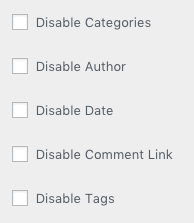 To disable the author in the slide check on Disable Author option. To disable the slider check on Disable Slider option. To exclude slider post from homepage posts check on Check to Exclude box and click on Save & Publish button. To set it go to Appearance > Customize > MagCast Pro Theme Options > Featured Slider Settings. Select slider layout to Carousel Slider as shown in below screenshot. 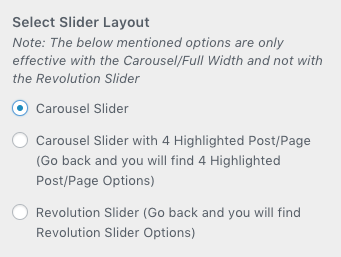 Select Slider Type to Featured Post/Page Slider if you want to set the slider from your post/page or select Image Slider if you want to set the slider title, content link and image manually as shown in below screenshot. By going one step back you will find the Post/Page Slider Options and Image Slider Option. 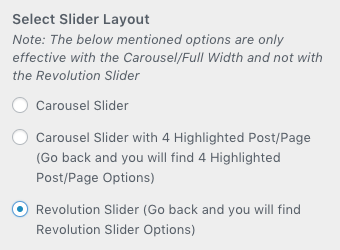 and for Image Slider Options you will see the below options for Image Slider. 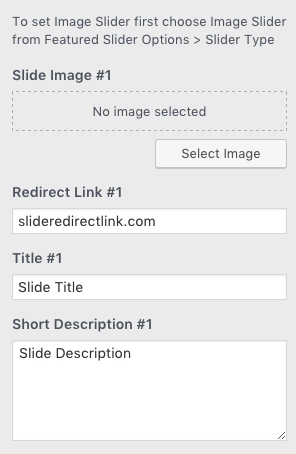 First select Slide Image, Add Redirect Link, Enter Title and Short Description accordingly to all of the slides. Select Slider Status to Enable on Homepage/Frontpage or Enable on All Page as shown in the below screenshot. 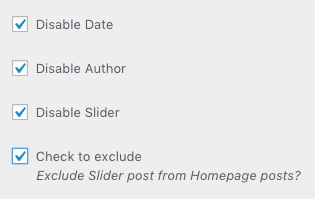 To disable the Date, Author and Slider check on the specific checkbox accordingly and to exclude slider post from homepage posts check on Check to Exclude box and click on Save & Publish button as shown in below screenshot. Go to Appearance > Customize > MagCast Pro Theme Options > Featured Slider Settings. Select slider layout to Carousel Slider with 4 Highlighted Post/Page as shown in below screenshot. By going one step back you will find the 4 Highlighted Post/Page Slider Option where you can add the Post/Page ID. 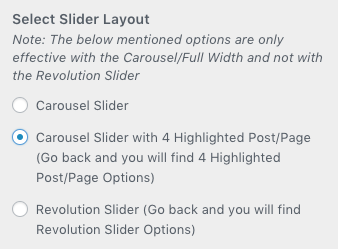 Select slider type to Revoultion Slider as shown in the below screenshot. After selecting the Revoultion Slider go one step back to MagCast Pro Theme Options (Appearance > Customize > MagCast Pro Theme Options) and click on Revoultion Slider Options panel. Choose the slider that you have created from the dropdown option as shown in the below screenshot. Check on Check to display on homepage box to show the slider on home page. 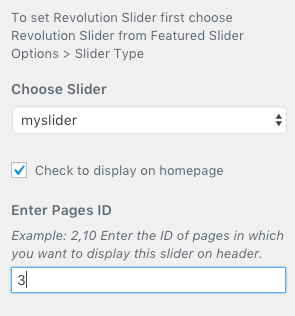 If you want to show the slider in different pages enter the page ID number of the pages in Enter Pages ID option and click on Save & Publish button. 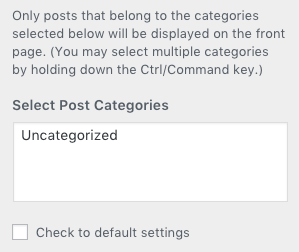 From this options you can highlight your posts. To set it go to Appearance > Customize > MagCast Theme Options > Post Ticker you will see the below screenshot. To enable/disable the post ticker select ON/OFF. 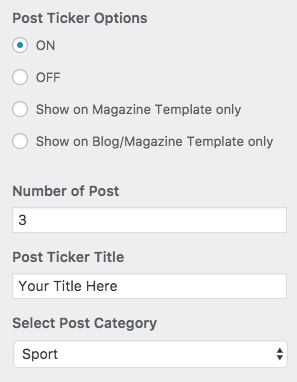 To show it only on Magazine Template select Show on Magazine Template only option. To show it on both Blog and Magazine Template select Show on Blog/Magazine Template only option. Enter the Number of Post, Type Post Ticker Title and Select Post Category to show. From this options you can hide the Social Profiles icon from the Header and Footer. To hide the social profiles icon from the header check on Hide Header Social Icons option. To hide the social profiles icon from the footer check on Hide Footer Social Icons option. You can set Font Family, Font Size and Font Color from below options. From this option you can set font family for Content, Site Title and Headings. To set it go to Appearance > Customize > MagCast Pro Theme Options > Font Family you will the same like below list of options. Click on dropdown option to select between 700+ Google Fonts for different sections. From this option you can set font size for different sections. To set it go to Appearance > Customize > MagCast Pro Theme Options > Font Size you will see the same like below list of options. Click on dropdown option to select font size for different sections. From this option you can set font color for different sections. To set it go to Appearance > Customize > MagCast Pro Theme Options > Font Color you will see the same like below list of options. 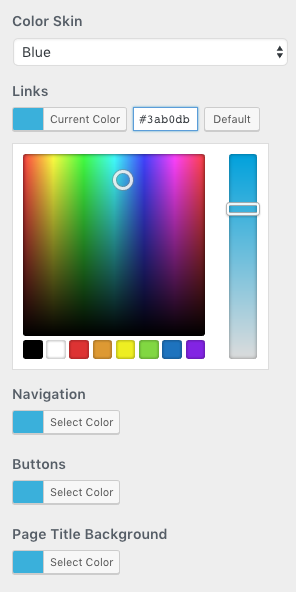 Click on Select Color button and you will see the color palette where you can select any color you like and then click on Save & Publish button. To set the color to default color just click on the Default button right to the Current Color button. From this options you can set the color skin of the theme. To set the color skin go to Appearance > Customize > MagCast Pro Theme Options > Color Skin then you will see the same like below list of options. Select the color option from the Color Skin dropdown. To set the different color individually for different section just click on Select Color button and you will see the color palette where you can select any color you like and click on Save & Publish button. From this options you can set the color for different sections. To set it go to Appearance > Customize > MagCast Pro Theme Options > Color Options you will see the same like below list of options. From this options you can select the color for category. Select ON/OFF to show/unshow the color if your have add the category as your menu in the main navigation. To set the color for different category. 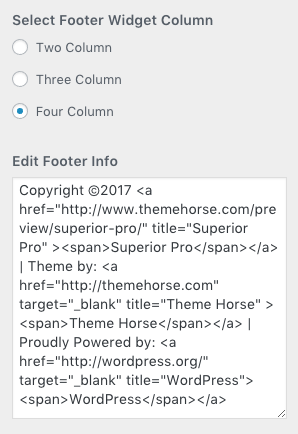 From this options you can select the Footer Widget Columns and edit the Footer Info. To set it go to Appearance > Customize > MagCast Pro Theme Options > Footer Options you will see the same like below list of options. Select the column Two, Three or Four to set the column for the footer widgets. To set your own content/links in the footer just type/edit the content in the textarea and click on Save & Publish button.